We remember Harvey Milk. We remember the Ramrod shooting. We remember Rebecca Wight and Claudia Brenner. We remember Brandon Teena. We remember Ali Forney. We remember the Backstreet Cafe shooting. We remember the Pulse Nightclub shooting. As Transgender Awareness Week recently concluded, we remember the countless trans/gender non-non-conforming siblings who died from gun violence. Consistent with our calling to work toward the end of violence and to co-create a world where peace flourishes, The Global Justice Institute has partnered with the Newtown Foundation for several years to promote the National Vigil to End Gun Violence in the United States of America. We share the following call to action and invitation to host local vigils. By this December, over 600,000 Americans will be killed or injured by guns since the Sandy Hook shooting tragedy. We urge you to join the gun violence prevention community in our collective effort to continue to shine a light on the devastating epidemic of gun violence in the USA until Congress takes meaningful action to reduce gun deaths and injuries in the nation. PLEASE REGISTER TO HOLD A LOCAL VIGIL OR A REMEMBRANCE EVENT TO #ENDGUNVIOLENCE HERE! The victims, survivors and the families impacted by gun violence are often forgotten. Therefore, the Newtown Foundation, the charitable arm of the Newtown Action Alliance, in partnership with American Gun Safety Association, Amnesty International, Brady Campaign to Prevent Gun Violence, Center for American Progress, The Coalition to Stop Gun Violence, Community of Sant’Egidio, Community Justice Reform Coalition, Docs Demand Action, Everytown Survivor Network, Faiths United to Prevent Gun Violence, Giffords: Courage to Fight Gun Violence, Junior Newtown Action Alliance, Moms Demand Action for Gun Sense in America, #NoRA, On Earth Peace, Organizing for Action, States United to Prevent Gun Violence, St Marks Episcopal Church, Survivors Empowered, Survivors Lead and Women’s March, will host the annual national vigil service of mourning and loving remembrance for all who have fallen victim to the ongoing epidemic of gun violence in America on December 5, 2018 in Washington, D.C. and also nationwide vigils/events during the month of December. You can reserve your seat at the December 5th national vigil service in Washington, D.C. HERE. We are looking for faith, gun violence prevention, student, social justice, LGBTQ, other organizations, activists, or concerned citizens to plan a local vigil/event in their towns and cities across the nation during the month of December. Our goal is to support the families & communities impacted by gun violence, unite the movement, educate, continue to raise awareness, and keep this critical issue front and center throughout our nation. 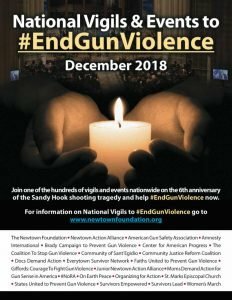 Please register to host a vigil or an event in your community HERE and click on the following links to download the 2018 National Vigil Toolkit and customizable posters to facilitate your planning and to coordinate our collective gun violence prevention message. Our goal is to hold vigils/events in ALL 50 states! The families of victims of gun violence and gunshot survivors can submit their photos to be included in the Annual Tribute Videos for the National Vigil HERE. Last year’s Tribute Videos can be viewed at the bottom of the webpage below the photo submission form. Thank you for your continued support and we look forward to working with you to #HonorWithAction to #EndGunViolence in America. This action alert was prepared by the Government and Policy Team of the Global Justice Institute, the Rev. Elder Pat Bumgardner, Executive Director.